Perfect Corn On The Cob~In The Microwave! If you want perfect corn on the cob but don’t want to spend time shucking ears and removing silks, look no further than your trusted microwave. The microwave is a cook’s best friend when corn on the cob is on the menu. This method is so savvy that I only wish I’d known about it long ago. For years, I have shucked and de-silked every piece of corn, boiled huge pots of water, and spent half an hour getting the finished product on the table. This method is so easy and effortless that fresh corn on the cob can be on the table in no time. Here’s how it works. Whole fresh corn can be microwaved intact. After cooking, the corn can be cut at the stem end and the cob squeezed out~perfectly cooked, silk free, and ready to butter, salt, & eat! I share how this technique works in the following video. Cook’s note: The corn may have to be cooked in several rounds, as only 3-4 ears will fit onto a microwave sized plate. Also, a good chef’s knife is needed to cut through the ends of the cobs. Place whole ears of corn on a microwave safe plate. Cook on high for 4 minutes per cob. 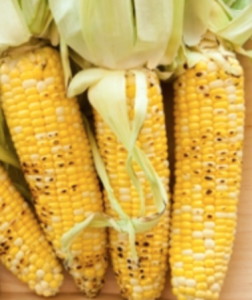 Remove from microwave; cut each cob off at the stem end (about 1″ into the last row of kernels). Slather with butter, sprinkle with salt & pepper, and enjoy!